Customer service is the competitive battleground for most businesses. The book, written by internationally acclaimed entrepreneur Feargal Quinn, is a hands-on guide for people who run businesses or work in them, written in a simple, jargon-free style. This is an essential handbook for managers, company directors, employees and students. "​Customer service is simple, focused and about engaging your people first. Feargal's book shows you just how to do this." "Listen to customers. Lots of people say this now, but Feargal said it first. He created a wonderful supermarket built around the shopping experience, which became a model for retailers around the world. The book explains how it was done in a simple, clear way. It's a unique story from a unique person." 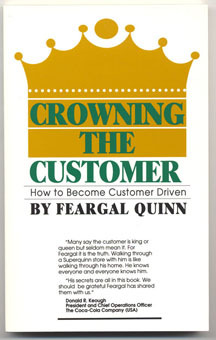 "Instinctively and obsessively, Feargal Quinn looks at business the way his customers do: noting the apparently tiny things and drawing from them huge conclusions. No theory is advanced without practical, entirely convincing, examples. And not a single instance of management-speak. The very best businessmen will be the first to welcome this splendid book."